If you’re lucky, you may still be able to find yourself a pair of fresh pastel Tennis Hu kicks, the first release of Pharrell’s new collection from Adidas. If you’re lucky, you may still be able to find yourself a pair of fresh pastel Tennis Hu kicks, the first release of Pharrell Williams’ new collection from Adidas. The latest footwear collection from Adidas Originals and Pharrell Williams was released on August 10, all around the world and online, for a suggested price of $110. The Tennis Hu is a lightweight sneaker, which has a sock-like construction and breathable mesh uppers. The Adidas Originals x Pharrell Williams collection also introduces a palette of new colorways, too, which includes tonal iterations in tactile rose, icy blue and linen green. The colorways aren’t the only touches by Pharrell, though, as there are also patches on the heels that are decorated with three graphic strips specially designed by the singer and producer. Introduced this past spring, the Tennis Hu is Pharrell’s first-ever signature model with Adidas, which was inspired by the iconic Stan Smith shoe. For this collab, Pharrell took design cues from the classic tennis shoe to create low-top sneakers, which have been highly sought-after since the debut. While there is a “Solid” pack set to be released in September, Pharrell and Adidas chose to first introduce a “Pastel” pack for his signature sneaker, which continues to pay homage to that classic Stan Smith silhouette. 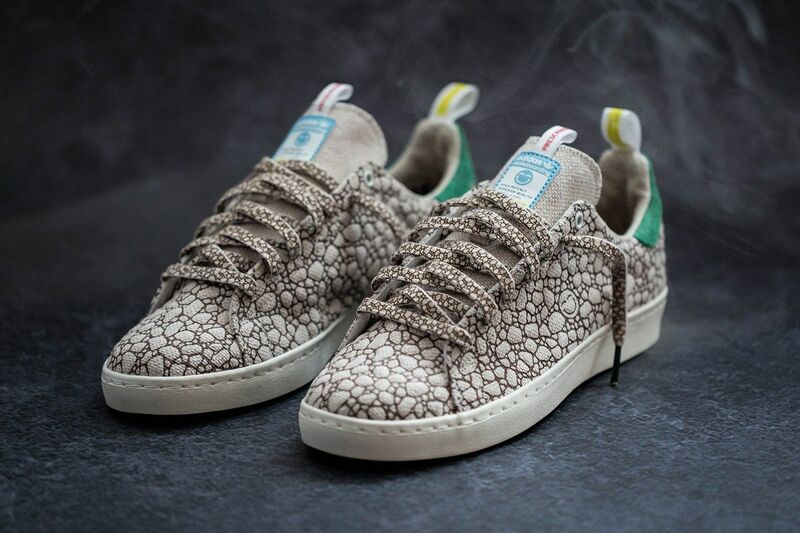 If you still want some unique Adidas kicks, but aren’t keen on the Adidas Originals x Pharrell Williams collection, you might want to hunt out a pair of the Happy 420 Stan Smith kicks. Not only did the limited release pay homage to medical cannabis in the design and colorway, including tags that look like prescription decals, but the shoe was also made from hemp. Best of all, the Happy 420 also includes a handy stash pocket, too.